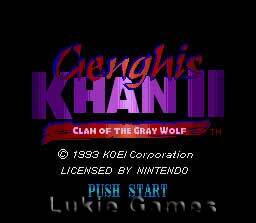 Genghis Khan II 2 SNES Super Nintendo Game Cartridge Cleaned Tested and Guaranteed to Work! 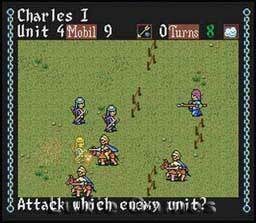 Unleash Mongol Hordes! In an age of conflict, you have been chosen to rule. Military strength, as well as political artistry must be used to build an empire that spans the continents. 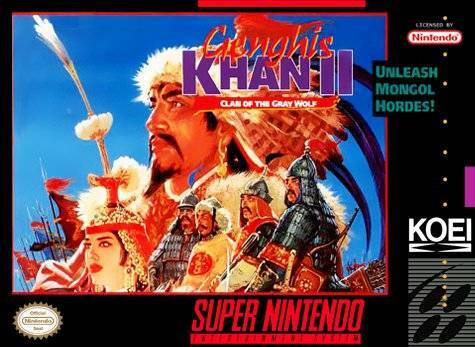 Legendary sages and warriors will be your companions - or your bitter foes! 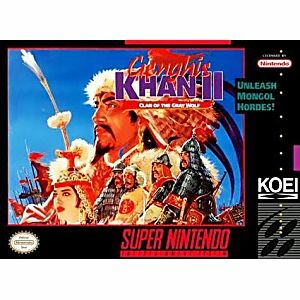 Lead your knights, samurai and elephants across the blazing sands of Arabia, through the Burmese jungle and into the grassy hills of the British Isles. Cross the Silk Road with Marco Polo and debate policy with Thomas Aquinas. Give the order to attack from the safety of your fortress or march to war at the head of your legions. Be careful to groom a successor and your great dynasty will live on!